Traditional Wedding Anniversaries - Who doesn't love them? 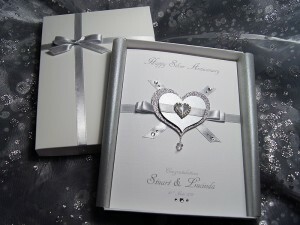 tips, anniversary card, anniversary, handmade, 5th (wood), 10th (tin), 15th (Crystal), 20th (China), 25th (Silver), 30th (Pearl), 35th (Coral) 40th (Ruby) 45th (Sapphire), 50th (Gold), 55th (Emerald), 60th (Diamond), 65th (Blue Sapphire) and 70th (Platinum), Which card should I choose? Who doesn’t love an anniversary? Especially the tradition of giving your loved one a gift or card that symbolises the strength and number of years you’ve been married? I personally prefer to stick with the traditional symbols as opposed to the modern list, as really who can get excited about white goods? Now I’m not saying white good aren’t useful, they are, but it’s not quite the same. As with most traditions it has to have started somewhere? But where….to avoid giving you a full blown history, I’ll summarise. According to my extensive research this tradition dates back to Europe in the middle ages where traditionally 25 and 50 years of marriage where celebrated whereby either a silver or golden wreath (depending on the number of years) was presented to the wife on their anniversary. So I suppose if you were a purist you would only consider the 25th and 50th wedding anniversaries to celebrate, but where‘s the fun in that? But of course through time traditions change and evolve, and so additional years and symbolic gifts were added to the more familiar list you see today. The main anniversaries which are commonly considered by most as a milestone, is every fifth anniversary, so these would be: 5th (wood), 10th (tin), 15th (Crystal), 20th (China), 25th (Silver), 30th (Pearl), 35th (Coral) 40th (Ruby) 45th (Sapphire) , 50th (Gold), 55th (Emerald), 60th (Diamond), 65th (Blue Sapphire) and 70th (Platinum). But the traditional list varies within different countries, notably the US and UK versions which you may have seen and some of the US traditional symbols have been adopted into the UK one. So now we know all the milestone ones, what about the ones in between? Well here is a little list I compiled earlier which also lists some of my handmade card designs against the relevant anniversary should you need assistance in selecting a suitable card. I will still be adding new designs to the anniversary section so you can have something unique and relevant to present your spouse or the happy couple with. If there is a design you like but would like it adapting to a particular milestone wedding anniversary, please do get in touch. I’d love to hear what’s traditionally given in your country for particular anniversaries if different from the above, so please do leave a comment. This entry was posted in General and tagged tips, anniversary card, anniversary, handmade, 5th (wood), 10th (tin), 15th (Crystal), 20th (China), 25th (Silver), 30th (Pearl), 35th (Coral) 40th (Ruby) 45th (Sapphire), 50th (Gold), 55th (Emerald), 60th (Diamond), 65th (Blue Sapphire) and 70th (Platinum), Which card should I choose? on October 9, 2013 by Sherrie.